Photonic thermometers; separating rare earths; printing solar cells. The National Institute of Standards and Technology (NIST) has developed a new class of photonic thermometers. These chip-based thermometers measure temperature using light. They are resistant to electromagnetic interference and are self-calibrating. In the future, photonic thermometers could be buried into walls or sent into space. They could be used for chemical, pressure and humidity detection. The thermometers consist of a ponytail of optical fibers. 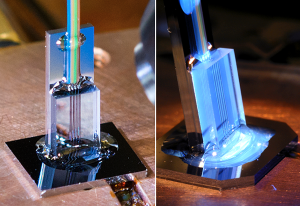 A transparent epoxy material connects a fiber optic array at the top to a photonic chip at the bottom. The chip itself contains two temperature-sensing devices. Photonic thermometers work by manipulating light with structures etched into the chip. One of NIST’s first thermometers contains only four optical fibers. Researchers could scale the fibers by twelvefold using off-the-shelf arrays. These contain as many as 48 optical fibers in a block. Researchers have tested the new photonic thermometers from 10 to 80 degrees C. They are also testing various and new types of adhesives for the fiber-to-chip bonding process. This, in turn, could allow them to use a packaged photonic chip at cryogenic temperatures, according to NIST. Rare earths are chemical elements found in the Earth’s crust. They are used in cars, consumer electronics, computers, communications, clean energy and defense systems. China has a monopoly in rare earths, accounting for 85% of the world’s total production of these elements. KU Leuven, meanwhile, has discovered a method to separate two rare earth elements: europium and yttrium. This, in turn, could help recycle these two rare earth elements, which are used in fluorescent lamps and low-energy light bulbs. Named after the continent Europe, europium is a moderately hard and silvery metal. It is used as a red phosphor in TVs and fluorescent lamps. Meanwhile, yttrium is a silvery-metallic element. It is also used to make red phosphors. Applications include TVs, CRTs and LEDs. These two rare earths are difficult to mine. So, the industry would like to recycle them. In the recycling process, it is necessary to separate europium and yttrium. “The traditional method dissolves europium and yttrium in aqueous acid. An extractant and a solvent are then added to the aqueous liquid, leading to two separate layers known as ‘phases’: an aqueous layer containing the rare earth metals and a solvent layer with the extractant. When the two layers come into contact, one of the two rare earth metals is extracted to the solvent, while the other rare earth metal remains in the aqueous layer,” said Tom Van Gerven, a professor, on the university’s Web site. But this process needs to be repeated dozens of times to recover a rare earth metal. And the process is inefficient and can cause impurities. 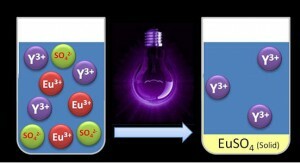 To solve the problem, researchers can recover europium from the liquid mixture by using UV light. “The UV light influences the electrically charged particles known as ions. Both europium and yttrium have three positive charges per ion. 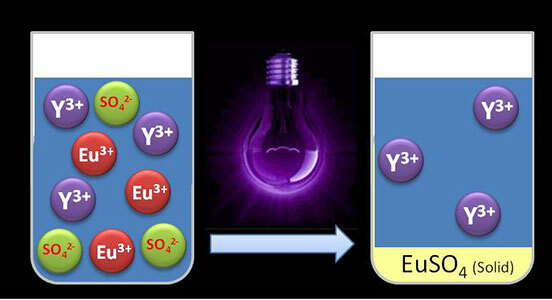 When we shine UV light upon the solution of europium and yttrium, we add energy to the system. As a result, one positive charge per europium ion is neutralized. When we add sulphate, only the europium reacts with it. The result is a precipitate that can easily be filtered, while the yttrium remains in the solution,” said researcher Bart Van den Bogaert. Helmholtz Zentrum Berlin (HZB) has developed an inkjet printing technology to produce kesterite thin film absorbers. With these absorbers, researchers have developed solar cells with an efficiency of up to 6.4%. On one hand, this is a relatively low efficiency. On the other hand, the inkjet printing method minimizes waste in the production process. It can also reduce the cost of raw materials. To enable the technology, researchers devised a molecular ink, which is produced by dissolving copper, zinc, tin metal salt and thiourea in a dimethyl sulfoxide solvent. The absorbers were formed by annealing the inkjet-printed Cu-Zn-Sn-S precursor film under an atmosphere containing selenium. “Although the solar cell performance is still far below the record efficiency of 12.7 % for CZTSSe based solar cells, the great advantage of our approach is the low toxic and low material wastage process,” said Martha Lux-Steiner, a professor, on the organization’s Web site.